Really sharp Accutron, Mr Toad - what year is that? Mid-60s? Todd, that is a great looking watch! The case looks perfect! So happy for you! Take good care of It and don't forget to wear it a little! 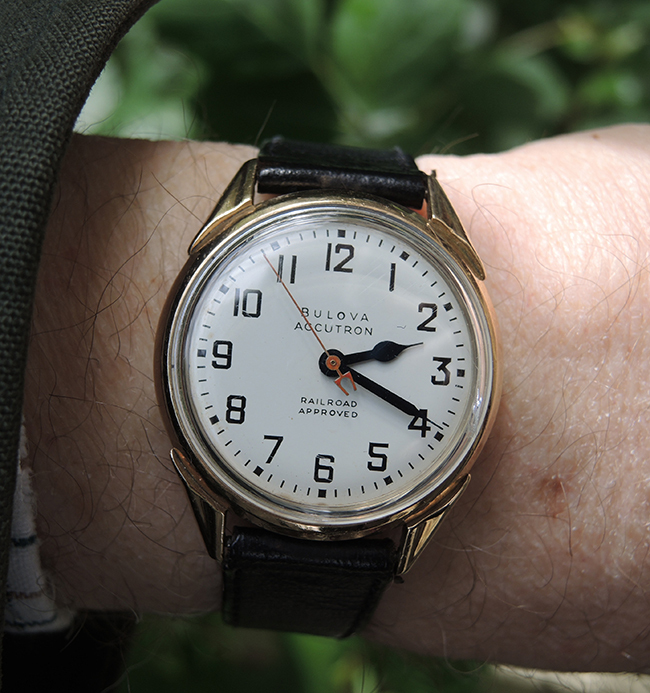 For Friday, I had on the 65'-66' Clearview, 505 movement, easy to explain to my buddies what an "electric" watch really is! Then their eyes roll, "He's talking about his watches again! Patrick, I know that "he's talking about his watches" feeling. That "Clearview" is amazing. For Saturday, my coral gold "Brock"
I don't know Accutron the way I do Illinois, but since this one has a 214 movement, I'm guessing early '60s, maybe about 1962. Check the case back for the date code. M2 would be 1962, N0 would be 1970, etc.